For 1965, the SCCA (Sports Car Club of America) created three new single-seater formulae: Formula A, for 3-litre racing engines, Formula B (later better known as Formula Atlantic) for 1.6-litre production-based ('stock block') engines and Formula C for 1.1-litre engines. The capacities chosen matched the forthcoming 1966 Formula 1 (3-litres), the planned 1967 Formula 2 (1.6-litres) and the long-established Formula Junior (1.1-litres) but they also had a long tradition of use in American racing, 183 cubic inch (3-litre) having replaced 302 ci (5-litre) as the capacity limit at the Indianapolis 500 as long ago as 1920. With the 3-litre F1 not yet in force, Formula A attracted hardly any worthwhile entries in its first few seasons. The SCCA national championship for FA was not even competed in 1965 so the first national champion in Formula A was Harry McIntosh in 1966 who beat a paltry field in his ex-F1 1.5-litre Brabham BT7 (F1-1-63). The following year Chuck Kirkbride won in a Lotus 18 (372) but he was the only finisher in his class and some three laps behind the best Formula B car. A lucrative professional series started in 1967 but was dominated by FB cars. For 1968, the SCCA opened up Formula A to stock block engines of up to five litres, thus allowing in the 302ci Chevrolet engine that had been introduced for the SCCA's Trans-Am series. Major racing car constructors now built cars for the 5-litre rules, notably Eagle, winners in 1968 and 1969; McLaren, winners with the M10B in 1970 and 1971; Chevron whose B24 model won the British and Tasman series in 1973/74 and Lola, dominant from 1974 to 1976 with the classic T332. 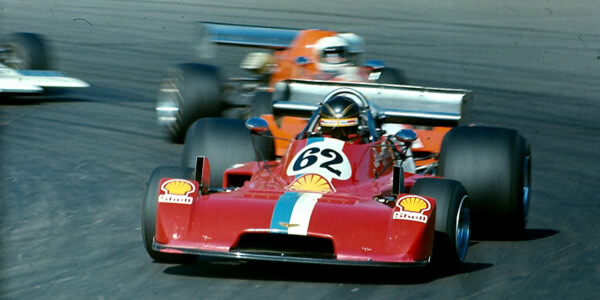 Meanwhile, a British F5000 series was launched in 1969 and the South African, New Zealand and Australian national championships were opened to F5000 cars in 1968, 1969 and 1971 respectively. After six seasons where F5000 racing seemed to have taken over the world, the decline was very rapid. The South Africans went first, adopting Formula Atlantic for 1976, New Zealand went the same way early in 1976, the US series was dropped at the end of that year and the British series turned into the British F1 series in 1977 and ejected the last F5000 cars after 1978. Australia held out, their unchanged cars carrying on until early 1982. The US Formula 5000 series was replaced by Single Seat Can-Am for 1977, giving good work to sports-car-bodied Lola T330/T332 cars right up to 1986. In this web site we attempt to fully chronicle all the FA and F5000 cars from all corners of the globe. It will take time, so please help us by contributing any additional information: email Allen at allen@oldracingcars.com.